Amid what appears to be an endless shortage, the amount of listings on the market has slowly ticked up, according to recently released research. Comparing October of last year to October of this year, there were 3 percent more listings on the market nationwide, the latest Zillow Real Estate Market Report shows. Inventory has been tight for three-and-a-half years, with buyers competing for limited listings all the while—and many at prices out of their reach. In October of last year, inventory was on a 10.2 percent slump. The best part? Inventory jumped in markets with the most severe shortages, including San Jose, Calif., the priciest in the U.S.
"In yet another sign that the housing market is cooling, we're finally starting to see inventory return after several years of annual declines," says Aaron Terrazas, senior economist at Zillow. "The combination of tight supply and strong demand have pushed up home values in recent years, but markets always ebb and flow, and there is no doubt that the tides that have buoyed sellers are shifting." However, "buyers are not out of the woods yet," Terrazas says. "While there are more homes for sale, rising mortgage rates are quickly eating into what they can afford to pay. First-time buyers have benefited from flat or falling rents over the past year—making it somewhat easier to save for a down payment—but the decline in rents could be short-lived if higher buying costs push some people back toward the rental market." At the end of October, mortgage rates were 4.68 percent, according to data from Zillow. Currently, they are hovering around 4.8 percent, based on estimates from Freddie Mac. 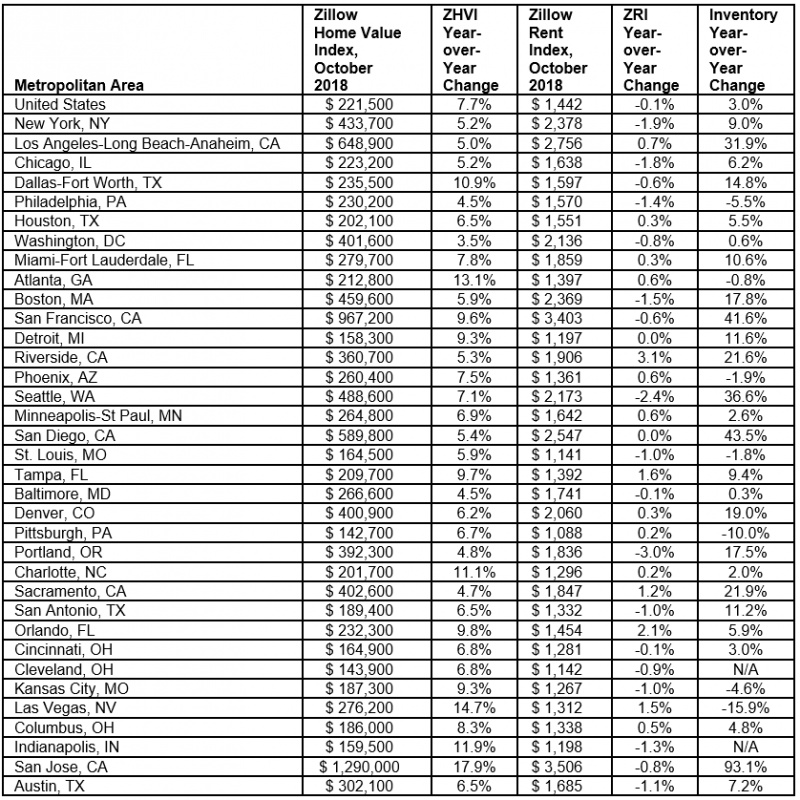 From October of last year to October of this year, the median rent slid 0.1 percent, the Zillow report shows; meanwhile, the median national price was $221,500—a 7.7 percent uptick year-over-year.